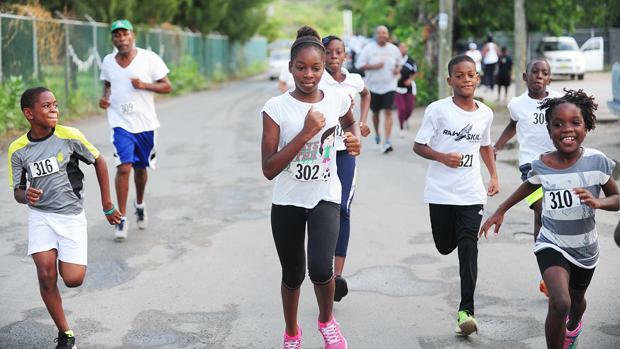 The Virgin Gorda segment of the 20th Highland Spring College Series closed with the fastest time ran in more than five years on Saturday, ahead of the curtains coming down on the Tortola leg this weekend. Running in the shortest race of his life, Vincent Fournier-who's preparing to challenge St. Thomas' Shane DeGannes for the 10th BVI Sunrise Half Marathon title on Dec 5 and end his winning streak-ran 10 minutes, 52.53 seconds to easily burry the field. Veteran Curwin Andrews, who placed third overall in 12:18, became a two-time overall champion after being pulled by Fouriner and youngster, Samuel Romney who placed second. Britney Peters of Raw Skillz Track Club-a Soccer goalie with Virgin Gorda United team-was crowned the overall women's champion and also the outstanding Female HLSCC participant. Keanu George was the Outstanding Male HLSCC participant. Bregado Flax Secondary's Harrigan House, was led to victory by Outstanding Secondary Female J'Sally O'Neal while Team Steven's Stallions of Bregado Flax was the Primary division winner. Race Director Stephanie Russ Penn was joined by Dr. Karl Dawson, HLSCC President in awarding and congratulating the participants and extended continued gratitude to the Virgin Gorda Community for their continued support of the event. Organizers also gave special thanks to the Valley Sound Lions Club for their assistance during the award's ceremony. Registration for Saturday's race on Tortola, begins at 6:30 a.m. and racing start at 7:00 a.m. An awards ceremony follows. Final Results: Two Mile, Men: 1. Vincent Fournier, 10 minutes 52.53 seconds. 2. Samuel Romney, 11:14.87. 3. Curwin Andrews, 12:18.62. 4. Emrol Amsterdam, 12:18.62. 5. Zebalon McLean, 12:39. 48. 6. Rainford Legair, 12:47.81. 7. Valique Graham, 13:11.59. 8. K'Cei Moses, 14:30.74. 9. Kasim Clarke, 17:10.06. 10. Ryan Joseph, 17:11.00. 11. Lindsay Pereira, 20:32.17. 12. Karl Dawson, 24.16. 34. Women: 1. Eonthra Sampson, 23:46.96. 2. Christina Yates, 25:45.22. Cross Country; Primary School Teams: Bregado Flax Primary Division Houses: Levons Leopards (L), Parkers Panthers (P), Stevens Stallions, Robinson O'Neal Memorial (ROMP): 1. Allena George, 17:43.79 (ROMP), 17:43.79. 2. Kaelyaah Liburd (PP), 17:58.62. 3. T'Khoy Stevens (PP), 17:58.84. 4. Sean Samuel (ROMP), 17:59.11. 5. J'Barie Drew (SS), 19:19.75. 6. Martoni Nisbett (SS), 20:24.37. Secondary School Teams: Bregado Flax Houses (Harrigan (H), O'Neal (O) and Rhymer (R)): 1. Joshua Ramphashad (R), 13:49.56. 2. J'Sally O'Neal (H), 15:54.65. Scores: 1. Rhymer, 1 (1 participant). 2. Harrigan House, 2 (1 participant). Overall Series Award winners: Two-Mile Overall Male Champion. Curwin Andrews. Female: Britney Peters. Under 20 Males: 1. Keanu George 2. Kasim Clarke 3. Sephile Arthurton. Primary School Division: 1. BFEC Steven's Stallions, 2. BFEC Parker's Panthers. 3. Robinson O'Neal Memorial Primary. Outstanding Primary School Male: J'Barie Drew. Female: Allena George & Alyssa Butler. Outstanding High School Female: J'Sally O'Neal. Outstanding HLSCC Male: Keanu George. Female: Britney Peters.